2015 has been quite the year for us. I just finished my first year of grad school and I am transitioning to a new job that will allow me to be at home with Mike once again. While I have loved my work in Madison the last 2 1/2 years, being away from my husband during the week was more difficult than I had anticipated. I’m sad to be leaving a great job and my wonderful coworkers, but I am excited to see what opportunities my new position will bring. Christmas is just a few days away, but the weather outside is more spring-like than winter. I’m not sure how I feel about the lack of snow. I’m trying to find ways to get into the Christmas spirit and this biscotti really hit the spot. 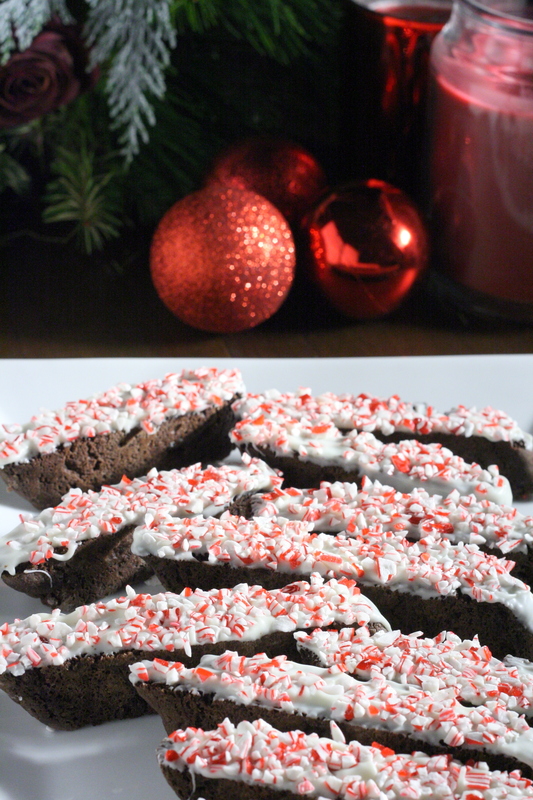 The double chocolate base pairs perfectly with the white chocolate and candy canes. It’s sweet and crunchy and perfect with a mug of hot chocolate or some coffee. I made my go-to Andes mint cookies for a cookie exchange last week, but I think that these biscotti will be my new holiday treat. So easy, so festive, and so good! I want to wish you and your loved ones a very merry Christmas and a wonderful new year! In the bowl of a stand mixer, beat the butter and sugar together until light and fluffy, about 1 – 2 minutes. Scrape down the sides and add eggs in, one at a time, until well combined. Scrape down the sides and add in the vanilla extract. In a medium bowl, whisk together flour, cocoa powder, baking soda, and salt. Add the dry ingredients and semisweet chocolate chips into the butter mixture and mix on low speed until just combined. Lightly flour a work surface. Using a rubber spatula, scrape the dough onto the work surface (it will be very sticky) and lightly dust with flour. Using your hands, shape the dough into a ball and divide into two even pieces. Form the dough into a log by rolling it back and forth. Place the logs onto the prepared baking sheet and press the dough into a longer log that is about 2 inches wide and 3/4 inch high. Make sure to leave enough room between the logs to allow them to spread slightly during baking. Bake in preheated oven for 35 minutes. Allow to cool on the baking pan for a couple minutes, or until just cool enough to handle. Using a sharp knife, cut the logs diagonally into 3/4 inch slices. Turn the biscotti onto their side and bake for 10 more minutes to allow the biscotti to crisp up. Allow biscotti to cool for 5 minutes on the pan and move to a wire rack to cool completely . Once biscotti are cool, it’s time to decorate them. Line the baking pan with a clean sheet of parchment paper. Place white chocolate chips into a microwave-safe bowl and microwave for about 1 minute, stirring every 20 seconds, or until chocolate is melted and smooth. Dip one side of the biscotti into the melted chocolate, using the back of a spoon to make sure the biscotti is evenly covered. Sprinkle with crushed peppermint candy. Repeat with the remaining biscotti, re-heating the chocolate as needed. Categories: Candy, Chocolate, Cookies, Dessert, Food | Tags: chocolate, christmas, cookie, dessert, food, holiday, recipe | Permalink. I took today off work with the hopes of getting stuff done around the house. My garden is a jungle of weeds. I need to dust, vacuum, and do approximately 20 loads of laundry. Instead of doing anything productive, so far today I have made bourbon caramel apple cinnamon rolls, biked to Baskin Robbins for ice cream, and watched a shameful amount of Netflix. I decided to blog a bit so I could cross at least one thing off my “to do” list. I’ve been meaning to share this cookie recipe with y’all for a while. 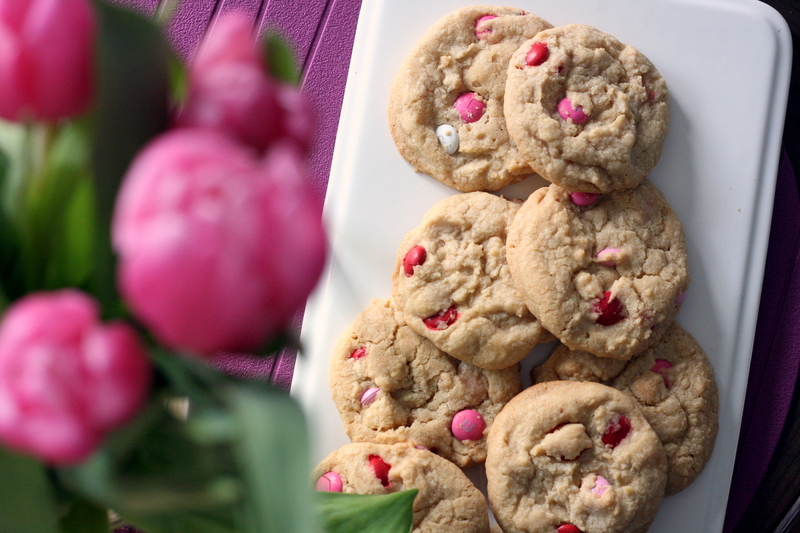 I first made them in the winter, during my search for the perfect chocolate chip cookie. I tested several recipes, and decided that Cook’s Illustrated’s Thick and Chewy Chocolate Chip Cookies were the winner. 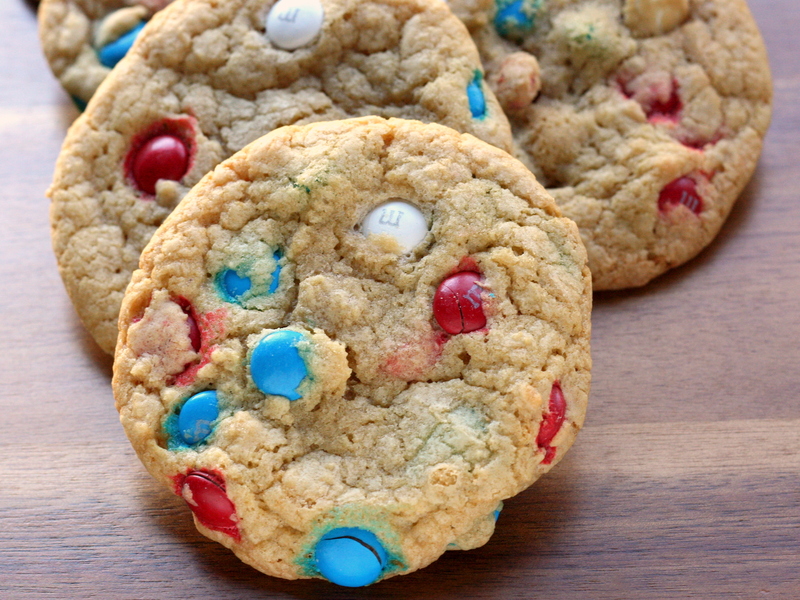 I’ve been making them 4 dozen at a time ever since with a variety of mix-ins – chocolate chips, M&Ms, nuts… basically whatever your heart desires. Mike told me that he prefers them with M&Ms, so I’ve been making them with just M&Ms ever since. The best part of this recipe? Unlike this awesome cookie recipe, it doesn’t require any overnight refrigeration. That means instant gratification. 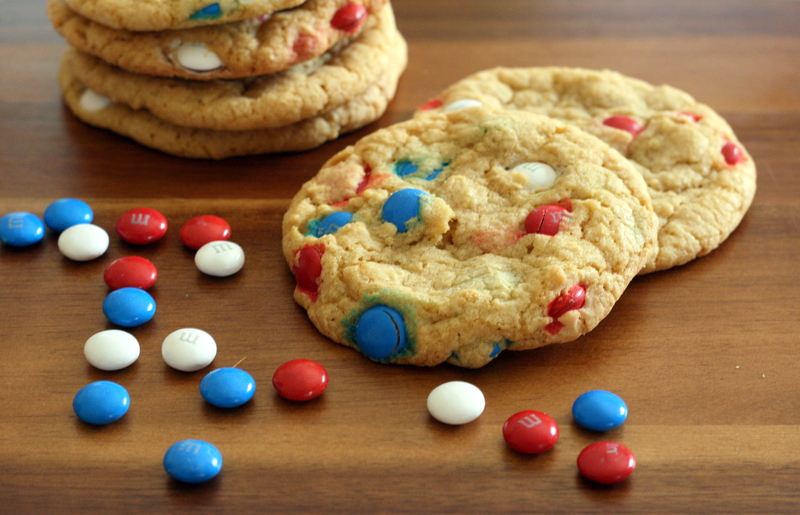 Enjoy them this holiday weekend with some red, white and blue M&Ms! Happy Independence Day, everyone! Preheat oven to 325°F. Line two baking sheets with parchment paper and set aside. In a medium bowl, mix together flour, salt, and baking soda; set aside. In the bowl of a stand mixer, mix butter, brown sugar, and sugar until blended. Mix in egg, yolk, and vanilla. Add in dry ingredients until just combined. Stir in chocolate chips. To form the cookie: Scoop a heaping tablespoon of dough and form it into a ball. Using the fingertips of both hands, pull the ball into two equal halves. Rotate the halves ninety degrees so that the jagged edges are facing up. Gently press the halves together to form a single cookie dough ball, being careful not to smooth out the jagged surface. Place the dough 2 inches apart on the prepared cookie sheet. Bake cookies for 10 – 13 minutes, or until cookies are a light golden brown and the outer edges have started to harden. Let cookies cool for 5 minutes on a cookie sheet before transferring to a cooling rack to cool complete. Categories: Chocolate, Cookies, Dessert, Food | Tags: chocolate, cookies, dessert, food | Permalink. I can’t really explain my obsession with Biscoff cookies. I love them so much that my sister hoards them from her travels and gives them to me. On her last trip back from the UK, she brought me a jar of Biscoff spread along with a handful of the cookies. The spread sat in my pantry for months; I didn’t know what to do with it. She threw some ideas at me – eat it with a spoon! on bread with Nutella! with a banana! – but none of them really sounded special enough to me. This was my first experience with Biscoff spread. I wanted everything to be perfect. 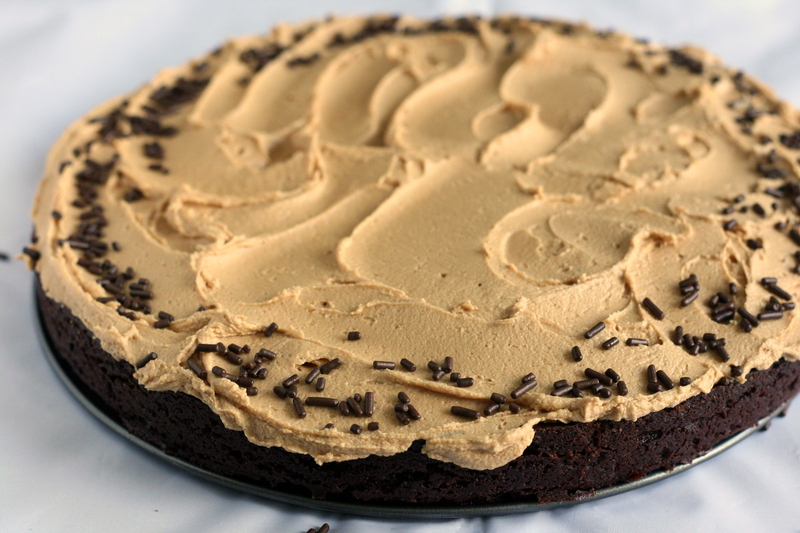 After searching a bit, I found this recipe for a Biscoff Brownie Cake and I was sold. I will admit that I ate a disgusting amount of frosting with a spoon. And I may have eaten a spoonful of the spread when I was making the frosting, too. Maybe. Preheat oven to 350°F. Line a 9-inch springform pan with parchment paper and butter parchment paper. Set aside. 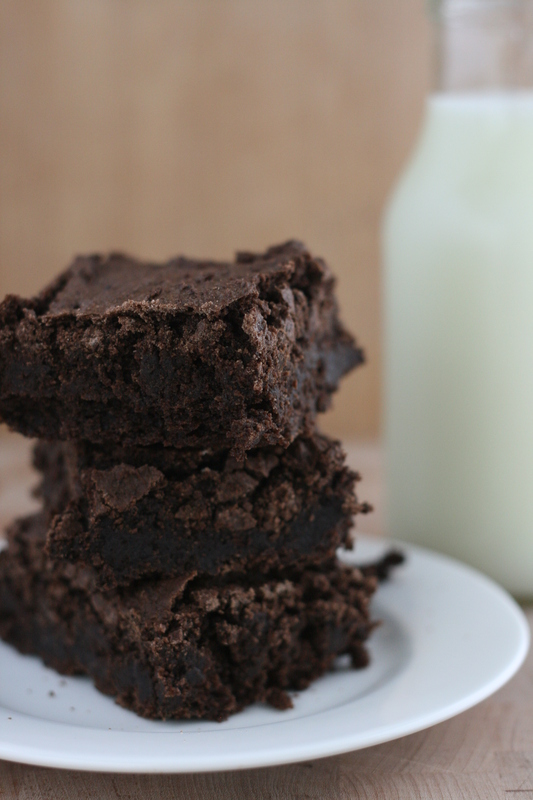 To make the brownie: Combine butter and chocolate in a large microwave-safe bowl. Heat in 30 second increments, stirring after each increment, until chocolate is melted and mixture is smooth. Set aside to cool slightly. Stir in sugar, salt, and vanilla until blended. Add in eggs, one at a time, stirring after each egg until well blended. Stir in flour and cocoa powder and mix until just combined. Scrape batter into prepared springform pan and smooth out the top with a spatula. Bake for 35 – 40 minutes, or until a toothpick inserted into the center comes out with a few moist crumbs. Set pan on a wire rack to cool. Run a knife around the edge of the brownie and release from the springform pan. 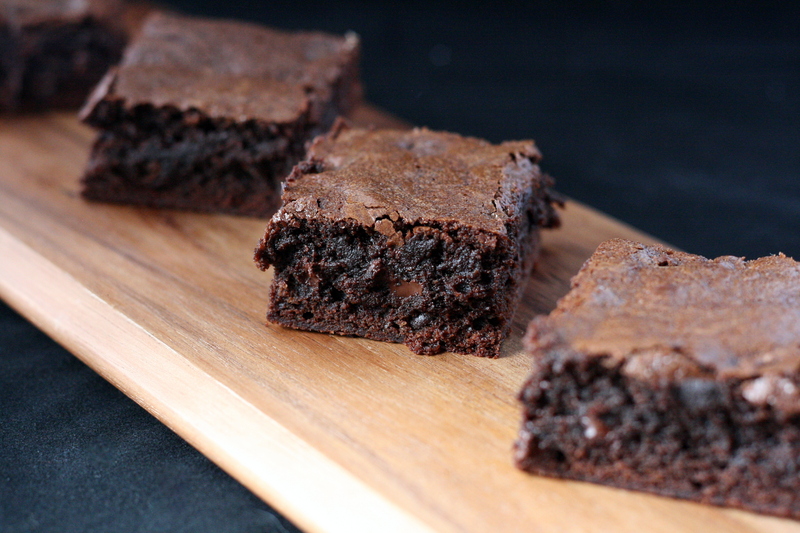 Flip brownie onto a flat surface and peel off parchment paper. Turn brownie right-side up and allow to cool completely. To make the Biscoff frosting: Beat butter and Biscoff spread on medium speed until smooth. Add in powdered sugar and milk until mixture is smooth. Add more milk and/or powdered sugar to reach desired consistency. 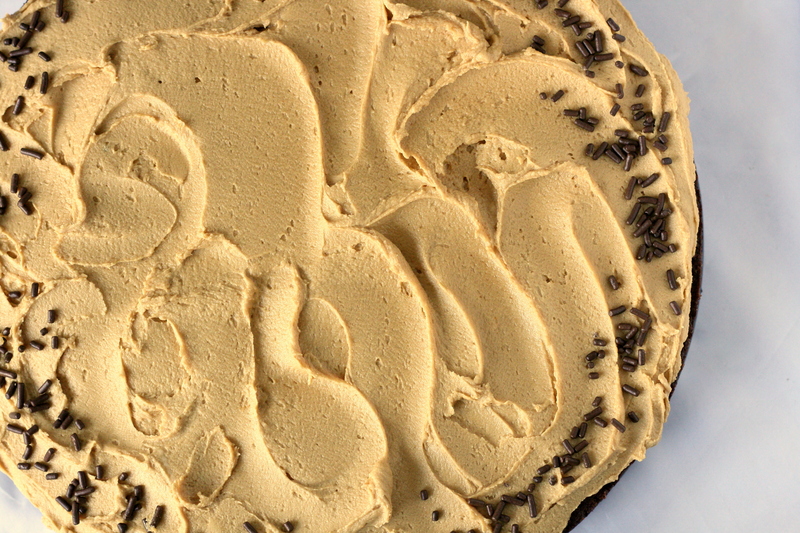 To assemble: Spread frosting on top of cake and smooth with an offset spatula. Decorate with chocolate sprinkles, if desired. Categories: Brownies, Cakes & Cupcakes, Chocolate, Dessert | Tags: brownies, cake, chocolate, dessert | Permalink. Asking me to pick between these bourbon fudge brownies and the espresso bourbon brownies I made a few months ago is like asking me to choose between Sour Patch Kids or Sour Skittles. It’s pretty much impossible for me to pick. They’re both delicious. 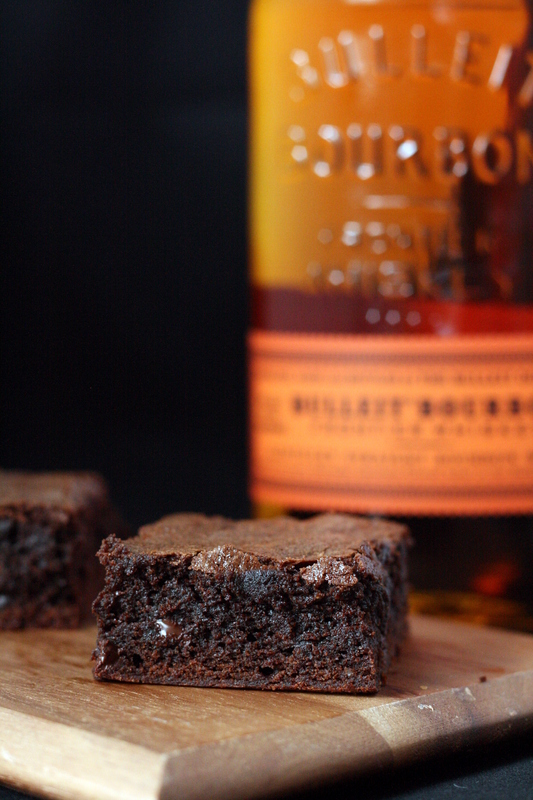 If you have people who aren’t huge coffee fans but still enjoy a nice hint of bourbon, these are the perfect brownie. Mike likes to eat these with a little glass of bourbon on the side. I love these best when they’re straight from the oven. I mean, seriously, does anyone actually wait for stuff to cool before eating? I’m pretty sure I spend most of my life with a burnt tongue and/or roof of my mouth. I should probably work on my self control. Preheat oven to 350°F. Coat a 9×9-inch baking pan with cooking spray and set aside. Bring bourbon to boil in a small saucepan. Remove pan from heat, add chocolate chips and stir until smooth. In a medium bowl, combine the flour, cocoa powder, baking powder, and salt and whisk until combined and lump-free. Combine the sugar and butter in a large bowl and beat with a mixer at medium speed until well combined. Add vanilla and eggs and beat to combine. Add bourbon and flour mixture and mix on low speed until just combined. Spread batter into prepared pan. Bake for 25 minutes or until a toothpick inserted in the center comes out clean. Categories: Brownies, Chocolate, Cooking with Alcohol, Dessert, Food, Quick & Easy | Tags: brownies, chocolate, cooking with alcohol, dessert, quick and easy | Permalink. I’m gearing up for the holidays once again. It seems like the reasons to bake are never ending- fundraisers, brunch and cookie swaps at work and just-for-the-hell-of-it treats for friends and family. I’m going to send as many holiday baked goods your way in the next few weeks. You won’t want to miss any updates, so make sure you’re signed up for my email updates or follow me on Facebook (check it out on the right). 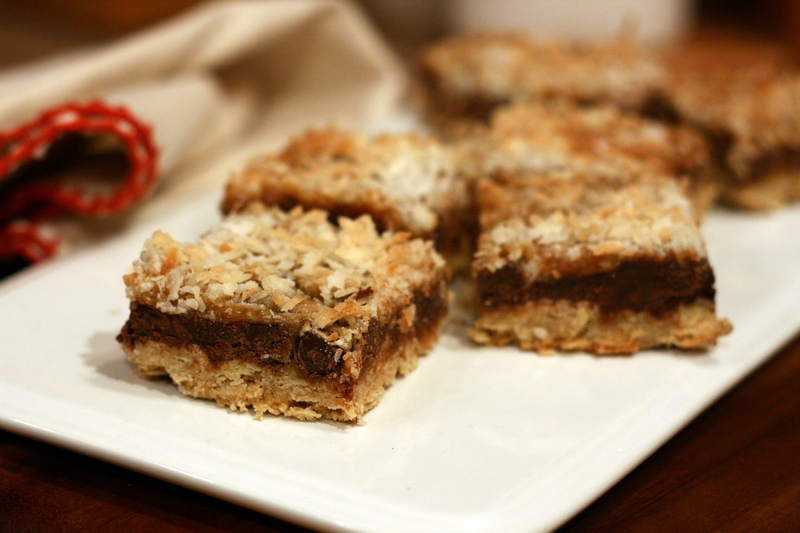 I’m kicking things off with these Chocolate Caramel Coconut Bars. You guys, this dessert it to die for. I got a bar similar to this at the farmers’ market a few weeks back. It was good, but not great. The bars were so insanely sweet that it took me four days to eat the tiny square. These bars? They’re definitely decadent and sweet, but not overly sweet. That said, I’m a big fan of sweet + salty, so I have a feeling that salted caramel will be making an appearance in the next batch I make! Preheat oven to 325°F. Line a 7×11-inch (or 9×9-inch) baking pan with parchment paper and set aside. In a small pan over medium heat, heat the caramels and heavy cream until caramels are melted. Remove pan from heat and stir in vanilla extract. Set aside. In a large bowl, mix together sugar, flour, oats, salt, baking powder and butter until mixture is crumbly. Press the mixture into the bottom of the prepared pan. Bake in preheated oven for 20 minutes. Sprinkle chocolate chips on top of crust in an even layer. Pour the caramel sauce over the chocolate chips and sprinkle the coconut on top. Bake for an additional 20 – 25 minutes or until coconut is toasted and the edges of the bars are golden brown. Let cool completely and lift the bars out of the pan with the parchment paper. Set on cutting board and cut bars into squares. Categories: Bars, Chocolate, Dessert, Food | Tags: bars, chocolate, dessert | Permalink. So, you know your favorite morning pick-me-up? (Yes, I’m talking about coffee). How do you make it better? Add bourbon, duh. And how do you make that better? Turn it into a brownie! The bourbon taste in this is definitely prominent, so make sure you make it with something drinkable. Another tip: if you like these, hide them. I left mine out and they were completely gone a couple days later. Mike inhaled these at an alarming rate. Preheat oven to 350°F. Line an 8×8 baking pan with parchment paper and set aside. Place butter and unsweetened chocolate into a small saucepan over medium-low heat. Cook, stirring frequently, until chocolate is melted. Remove from heat and let cool slightly. In a small bowl, combine bourbon and espresso until espresso has dissolved. Set aside. Stir sugar into slightly cooled chocolate mixture until incorporated. Add eggs one at a time, stirring after each addition. Stir bourbon-espresso mixture into the batter. Mix in flour and baking soda until just combined and then fold in the chocolate chips. Pour batter into the prepared baking pan. Use a spatula to make sure batter is evenly distributed and smooth on top. Bake in preheated oven for 30 minutes or until a toothpick inserted into the center comes out with moist crumbs. Allow brownies to cool completely in the pan on a wire rack. Remove brownies from the pan and cut into 16 pieces. Categories: Brownies, Chocolate, Cooking with Alcohol, Dessert, Quick & Easy | Tags: brownies, chocolate, cooking with alcohol, dessert | Permalink. Still here? 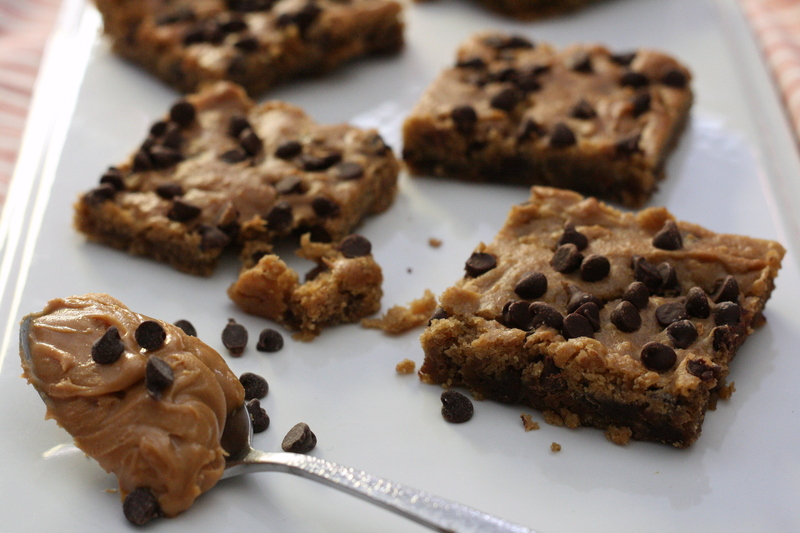 You didn’t run away at the mention of chickpea + chocolate + blondie? Good. Trust me – these are delicious. They don’t taste anything like beans. 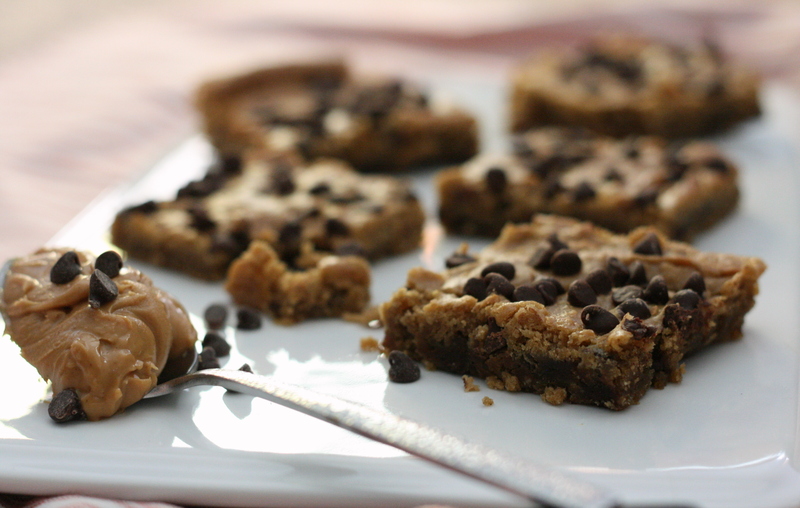 All you get is a chewy, delicious peanut buttery blondie studded with chocolate chips. The weird thing is, I actually found the unbaked batter to be tastier than the baked product. So you choose – bake it or just eat the batter by the spoonful. I won’t judge. Preheat oven to 350ºF. Grease an 8×8 square pan and set aside. Drain and rinse the chickpeas well. Remove and discard the skins from the chickpeas. Place the skinned chickpeas into the bowl of a food processor and blend until smooth. Add in baking powder, baking soda, salt, sugar, vanilla, oats, and peanut butter. Blend until very smooth. Mix in 1/4 cup of the mini chocolate chips and spread into prepared pan. Sprinkle remaining 1/4 cup chocolate chips on top. Bake for 30 – 35 minutes, or until golden brown on top, being careful not to overcook. The blondies will appear to be undercooked, but they will firm as they cool. Allow to cool completely before cutting into 16 pieces and serving. Categories: Bars, Brownies, Chocolate, Dairy Free, Dessert, Quick & Easy, Special Diets, Vegetarian & Vegan | Tags: bars, chocolate, dairy free, dessert, peanut butter, vegan | Permalink.